This bad machine will FLEX!! I have owned it for a few years and am selling to make room for something else. 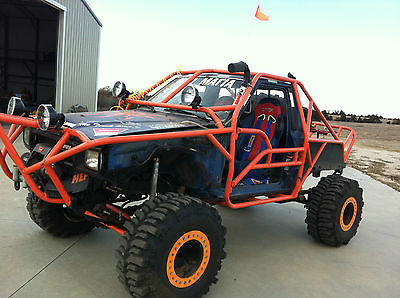 Some features include: -Massive Mud Bogger "Super Swamper" tires w/ beads (includes spare) -Full custom built roll cage -Adjustable racing seats w/ 3 point seat harness -Multiple winches w/ remotes (front Warn winch doesnt work) -Snorkle air intake system -Exhaust stack -Hydroalic power steering w/ stabilizers -Lift kit w/ Rancho shocks & leaf springs -Adjustable body "stance" using winch -Liteforce auxillary lamps (front & rear) -Neon undercarriage lights all around -Brand new carburetor -Compact fuel tank -Many engine enhancements -Swapped axles -Includes both doors if needed Will send more images upon request. Serious buyers only!! 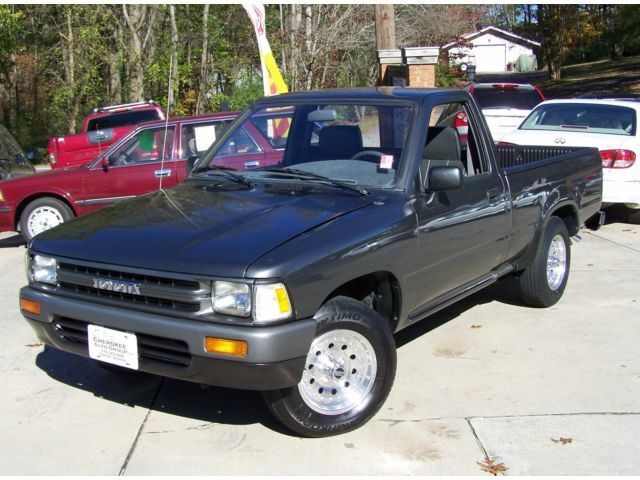 1990 Toyota Pickup with 5 speed manual 4 cylinder 4x4. This truck has a rough body with rust around wheel wells, rockers, and doors. However the frame on the truck is good! It does have some surface rust in some areas but still very solid. Front bumper and valance and passenger fender have body damage. Truck has 250k but engine was replaced at some point, timing chain and guides all in good shape, fluids clean. Truck runs, drives, rides nice and everything works. Has air conditioning works decent has new compressor and a CD player too. New clutch slave and master cylinder. Tires are okay and will pass inspection. All glass is good. Floors and bed floor still good. Needs inspection. 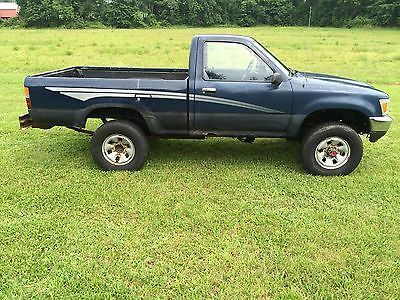 If the body was patched up or some panels replaced it would make a nice little truck with solid chassis and drive train Please email with any questions you may have.Thanks!